Congratulations to the Kauffman Eagle Scout Honorees! Bill Esry serves as President of Blue Ridge Bank. Chuck Hoffman is President of Hoffman Management. Zach Shafran is a Senior Vice President at Waddell & Reed. Rev. Roger Jackson is the Presiding Elder at AME Church. Congratulations to these outstanding Eagle Scouts! The Heart of America Council established the Ewing M. Kauffman Distinguished Eagle Scout Award and annually presents it to Eagle Scouts in our community who have held to these high standards in their adult lives. Recipients are selected based both on their contributions to Scouting and their contributions to the community, specifically the Kansas City area. Congratulations to William (Bill) Esry, Chuck Hoffman, Zachary Shafran, and Rev. Roger Jackson on being selected as Kauffman Eagle Scouts. They will be presented with this honor at the Scout Day at the K on April 10th. The day will start with a presentation in the outfield around 11:00 a.m. The recipients will then be recognized on the field in front of the entire stadium. More information about these distinguished gentlemen can be found on the HOAC website. Eagle Scout Reception a Hit! At the reception, Zane Schafer of Troop 1332, Blue Springs, MO, received the Glenn A. and Melinda W. Adams Eagle Scout Service Project of the Year Award. Myrl Wear, scoutmaster of Troop 93, Shawnee, KS, received the Paul D. Arend Distinguished Scoutmaster Award. David Chinnery, Hon. Kenny Garrett, and Jason Grill were presented with the National Outstanding Eagle Scout Award in recognition of their support of the Kansas City community and the example they set for new Eagle Scouts. 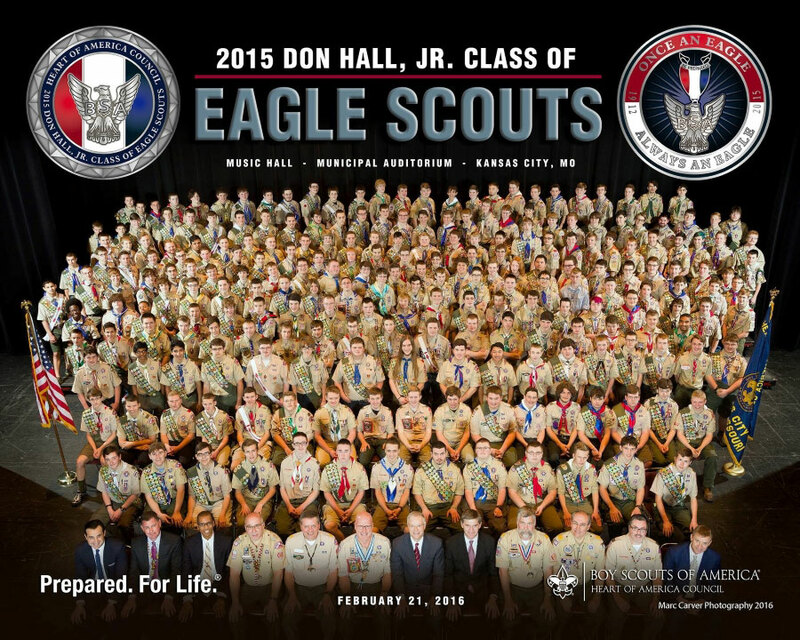 More than 900 Eagle Scouts were recognized for over 122,000 hours of community service on February 21, 2016 at the Municipal Auditorium in downtown Kansas City. In addition to being surrounded by family and friends, the Eagle Scouts were presented with a special challenge coin in order to encourage future involvement with Scouting and the community. 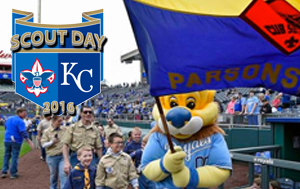 If you are going to Scout Day at the K, we would love for you to join us for a Royal Gathering of Eagles! The Eagle Alumni Association will be at Kauffman Stadium on April 9th before the game to host the Royal Gathering of Eagles. While tickets are sold out, Eagle Scouts in attendance are invited to join us in front of the outfield experience stage from 9:30 a.m. until 11:30 a.m. to network and learn more about the alumni association. Alumni association representatives will be on-hand to sign-up new members as well. At approximately 11:00 a.m., the Kauffman Eagle Scouts will be recognized on the outfield experience stage for their contributions to the community. Planning an Eagle Court of Honor? Request congratulatory letters! Letter from President to Jimmy Carter to Eagle Scout. Photo courtesy of Bryan on Scouting. Many of us can recall receiving a letter or two of congratulations upon earning our Eagle Scout award. These letters come from politicians, celebrities, military personnel, and many others – sometimes even including a framed recognition or a commemorative flag. If you are now in the position of recognizing a youth – whether your son, a youth in your troop, or another youth you have advised – you may be wondering how to request those letters. The first rule is to request the letters as soon as possible – depending on the letter-writer, these can take several weeks to arrive. Some institutions have a formal process for handling these requests. For example, you can contact your state legislator’s assistant or aide who will likely send you a form to complete to request a congratulatory resolution or letter. Other letter-writers, such as a local business leader or a politician no longer in office may be writing these letters on their own without staff assistance. While the Mayor and your State Representative are common letter-writers, consider asking for letters from anyone who may be significant to the Eagle Scout. Big fan of Mike Rowe? He’s been known to write congratulatory letters. Is the new Eagle wanting to go into medicine? The head of a local hospital may be willing to write a congratulatory letter. The possibilities are endless, and most individuals are willing to write a letter if you explain why you are requesting the letter from them. For more information and addresses of some common letter-writers, check out this great list by U.S. Scouting Service Project and these recommendations from Bryan Wendell at Bryan on Scouting.